Corporate Outbound Training - OBT Training or Outbound Learning is a training method for enhancing individual and team behaviors, organizational performance through outdoor actvities and experiential learning methodology. Outbound Training generally revolves around outbound activities designed to improve leadership, communication skills, planning, change management, delegation, teamwork, and motivation. 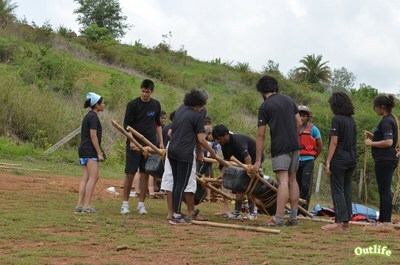 ​Participants are divided into teams and assigned tasks or activities for completion in a specified time. ​Outlife as an leading Outbound Training company, strongly believes in delivering impactful corporate outbound training programs that can be the key element of developing a tight knit, effective and high performance teams for your organisation. Outbound Training -OBT is an training methodology based on experiential learning in the outdoors and is conducted in an outdoor environment away from familiar settings like a trip to a green countryside with natural terrain, trees, rocks and hills. ​Strategies are formulated to deal with factors that hinder, and these strategies are then put to use in the activities that follow, to test their effectiveness and ultimately help the participants learn to change behaviors or processes back at work. 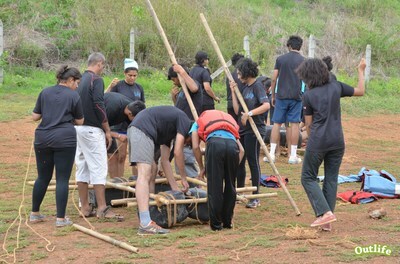 In the Outbound Training Activity, the facilitator invites the group to achieve a goal, but does not explain how to successfully complete the activity. ​Participants must work to find a solution individually and together as a team, and must communicate and learn from each other in order to be successful. 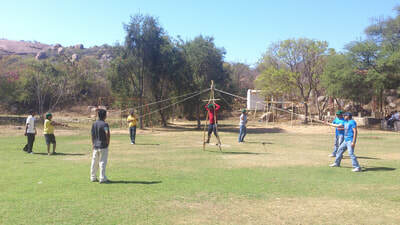 The main focus with the Outbound Training approach is to impart learning on organizational needs such as Leadership, Strategic Thinking, Conflict Management, Team Building, Effective Communication, Quality Improvement, Mentoring and Skill Development. 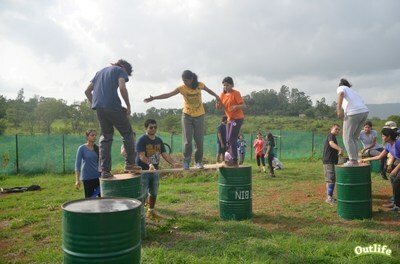 Outbound programs have been found to be effective to enhance self development, social and emotional development, teamwork and leadership. Other areas include behavior change and personal efficiency. After spending a time outdoors, team members tend to bond together in a way that is not possible concrete office environment. Outbound programs demonstrate that people can become more cohesive, shedding their inhibitions, opening up and becoming more receptive to learning. ​It also proves that in spite of differences in cultures and ethnic backgrounds, people can live and work together and that it is inherent in human nature to be helpful. ​In an environment such as this, it becomes possible for a sensitive and experienced executive coach or facilitator to identify weaknesses, strengths and suggest new coping behavior for trouble areas. Our Outbound Training facilities are specially designed for conducting experiential learning programs with elements of adventure, team building and challenge based learning.